I love the satisfaction of working really hard on something and then seeing it all come together. Even more, I love being part of a team of people who all bring different strengths and talents to a project. This weekend, I was blessed to get to do all of those things when our church leaders launched a two-year vision to the congregation. This is something that our staff has been praying out, processing and working on for about two years. 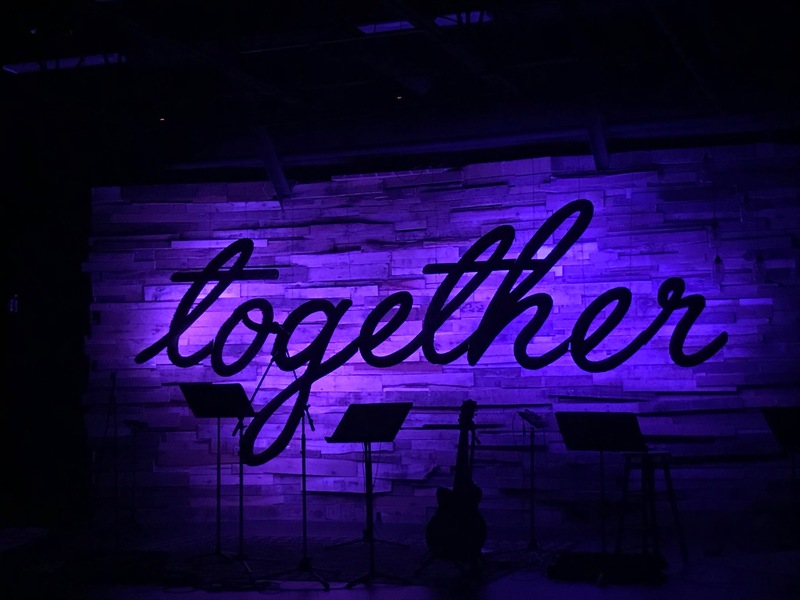 Almost from the beginning, as we began talking about where God was leading us in the next phase of our church, one word kept coming up: Together. As the communications director, I’ve been blessed to work on many projects to get ready to launch this two-year vision. I’ve had my head buried the past couple of months as I worked on print material, signage, video stories, web site stuff and more. 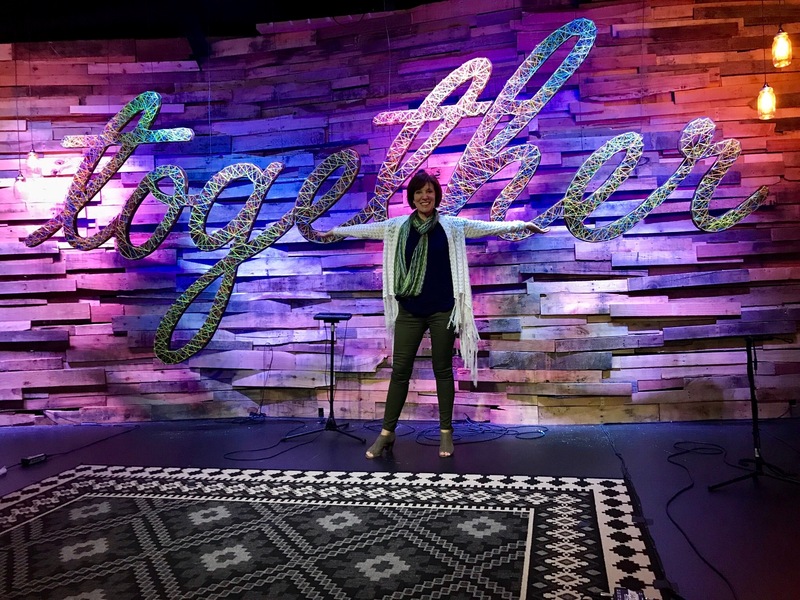 But the point of this blog post is to explain how we created a very large focal point in our auditorium to set the stage for the “Together” theme. 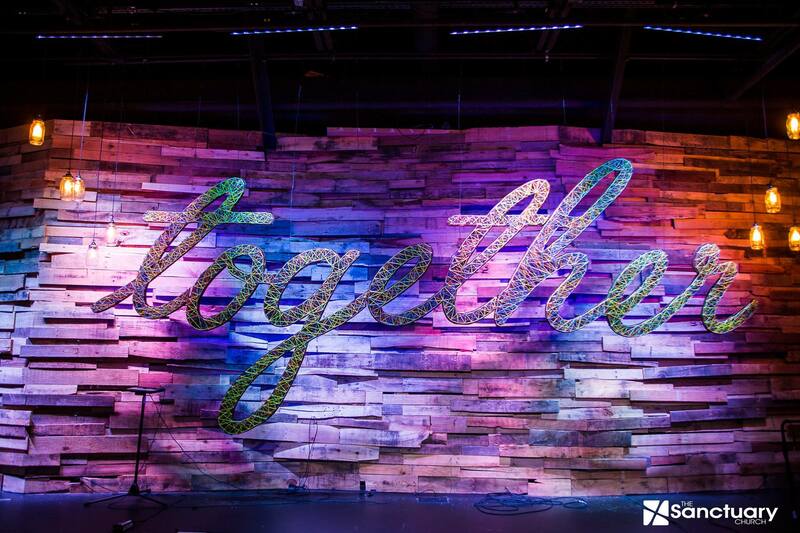 This weekend, we got to unveil our 18-foot-wide logo, created in string art on the stage of our auditorium. So many people have asked me HOW we did it! So, here’s how it all came TOGETHER! I was part of a Together planning team that has been working for several months on all aspects of the initiative. 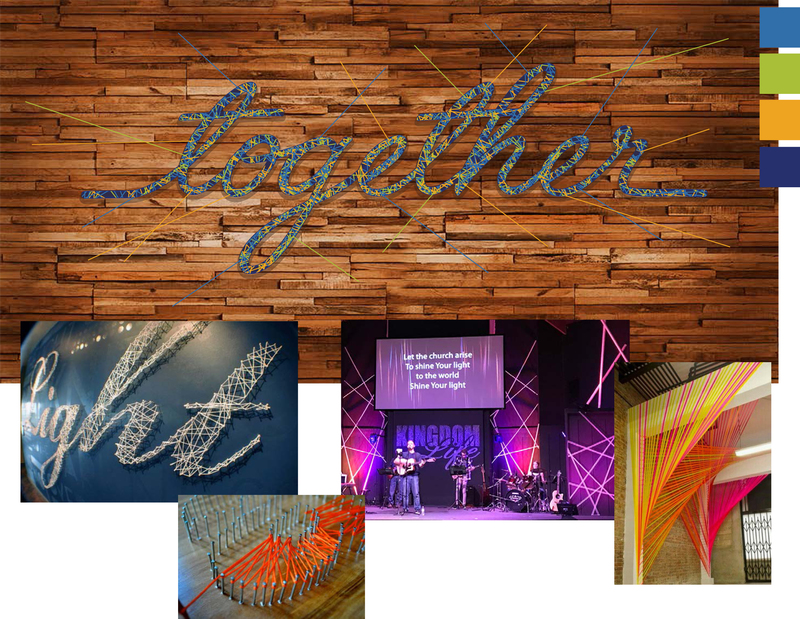 My partner in crime is a friend named, Craig, and he came up with the idea to use string or cord as a visual to communicate the idea of people joining “together.” He began researching how other churches have used string art to convey that message. He created a concept in Photoshop of what this could look like in our auditorium. We wanted to create the string art on the pallet wall at the back of our stage. 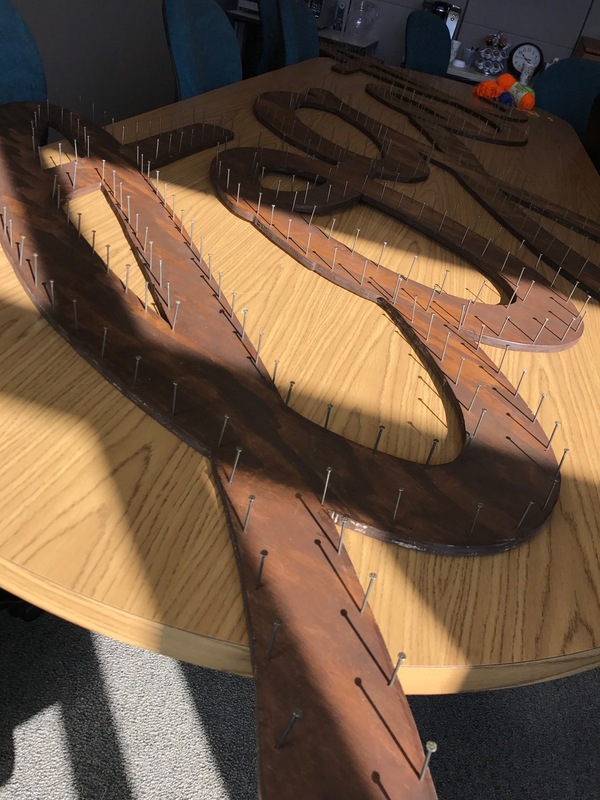 But we didn’t want to pound hundreds of nails directly INTO the wall. 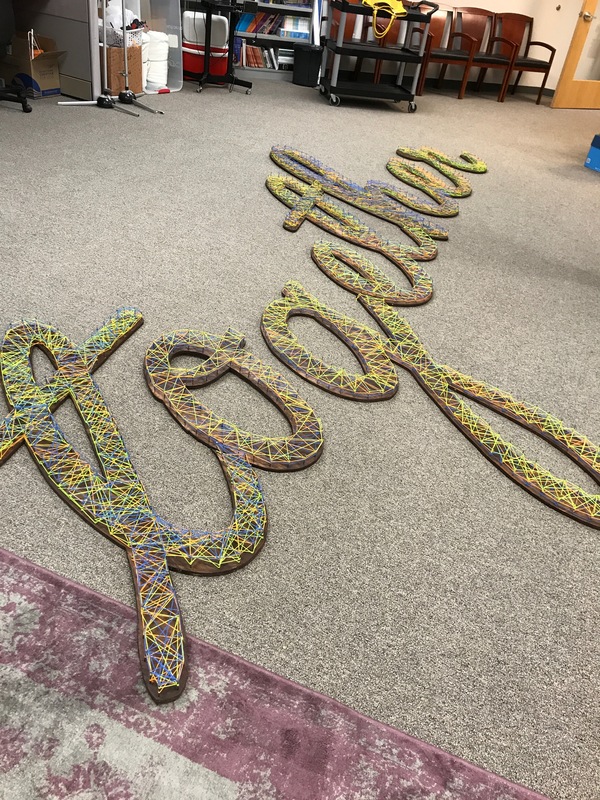 We wanted to be able to move the string art at the end of the “Together” sermon series to display it in another location. We needed it to be light enough to install, and it needed to be created in a way that we could move it. The last thing we wanted to do was to create some amazing artwork and then realize it was too big or too heavy to install. We also needed to figure out how it would be installed. The pallet wall is actually curved, so we realized hanging the sign directly on the wall wouldn’t be possible. At first, we thought maybe we would build a second pallet wall in front of the permanent wall. This seemed like a good option, but also a TON of work! It would be heavy, difficult to move, and it would also take up a lot of space. Someone mentioned actually cutting out the letters, which sounded like a cool idea. But HOW would we even do that? That’s when my husband, Kent, stepped in with his many hidden talents. Just as I had no idea he was capable of building that coffee bar I wrote about last year, I didn’t know he could cut huge curved cursive letters! 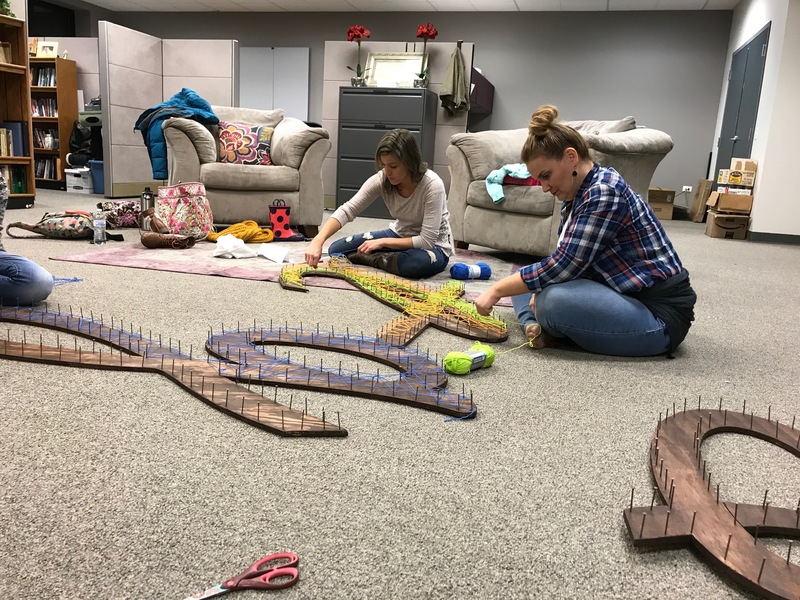 When we first started this project, I was mainly focused on how we would string the letters with yarn. 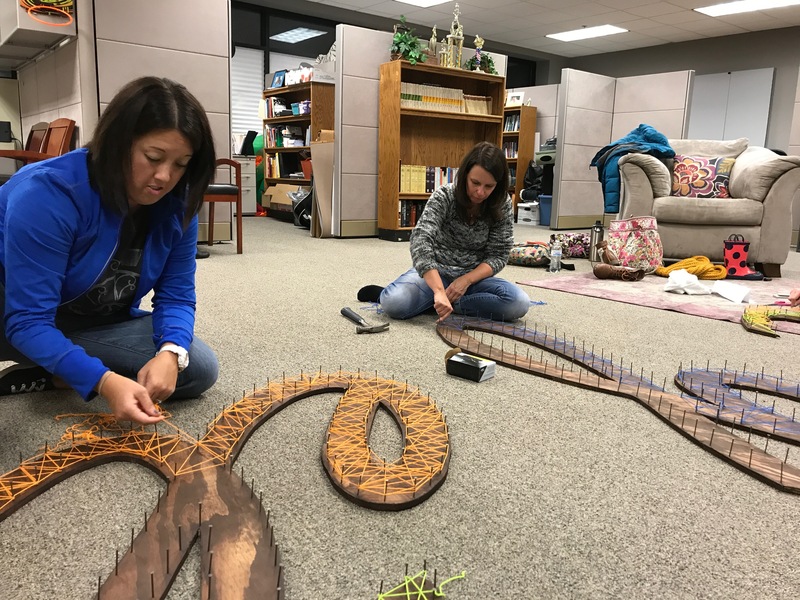 As we progressed, I realized that all of the steps leading up to the actual string art were the real challenge. The first thing we had to do was figure out how big the letters needed to be. My husband and I made the letter “t” as a prototype. We made it three feet tall, and took it into the auditorium to determine if it was large enough. Several people on our team came by to take a look and we all decided it needed to be BIGGER! I used my Silhouette software to design the logo even larger. 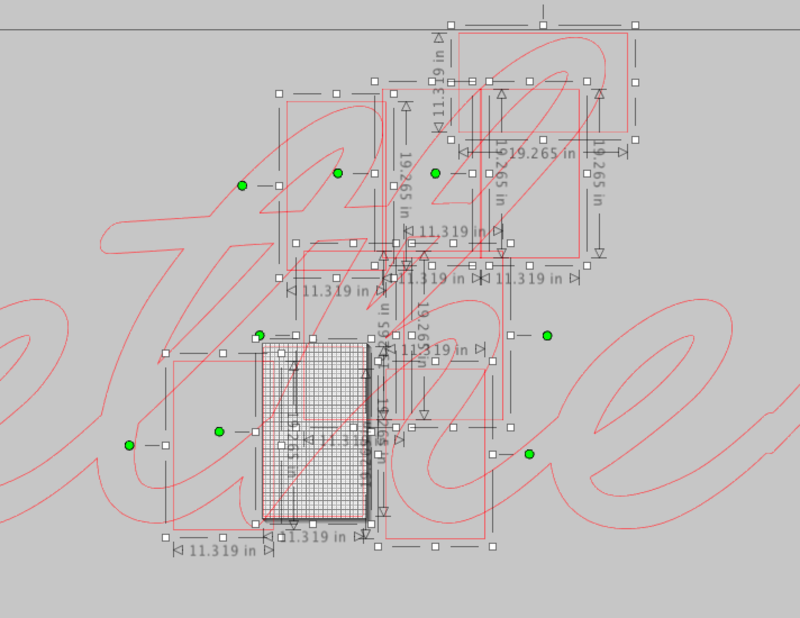 This time, the tall letters would be more than 4 feet tall. This meant the entire word would be 18 feet wide! 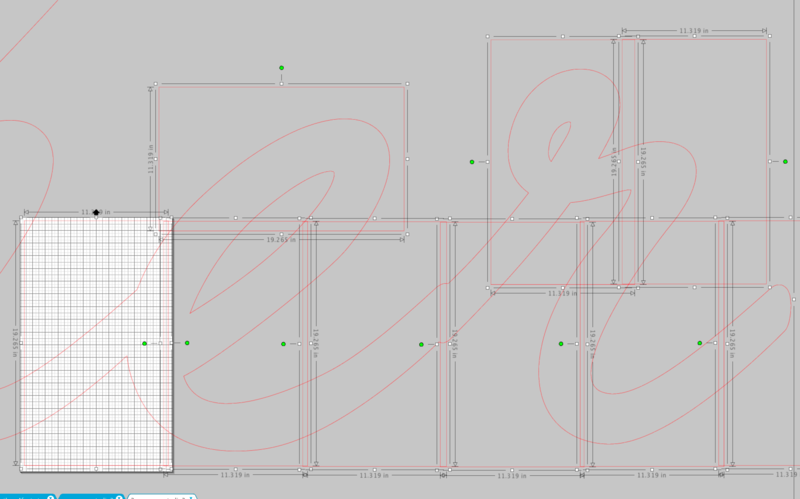 On the largest letters, I had to cut as many as nine strips of contact paper to create the design just for that letter. For all eight letters, I probably cut more than 40 strips of contact paper. 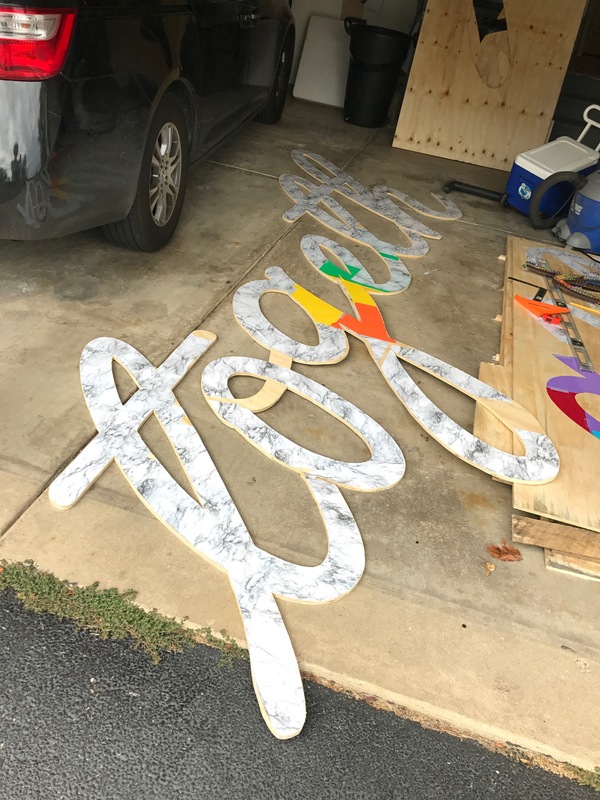 I then took the contact paper into the garage and tried to piece the letters back together to create a template. Reassembling the puzzle was surprisingly more difficult than I anticipated. My Silhouette leaves a margin of about one inch on each side of the material. 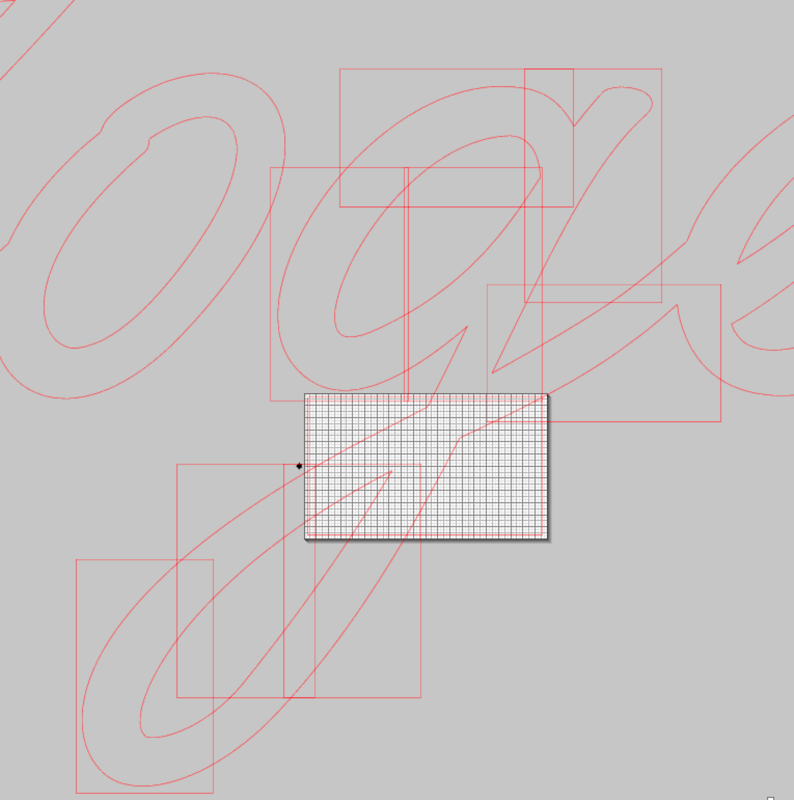 That meant, I needed to overlap my strips to cover the entire letter. It took me a while to get this right. As soon as you lay down the contact paper, overlapping with another sheet that is already on the wood, it would stick. This created lots of frustration of trying to peel it back up to lay out everything just right. At times, I would get a bit off and this would just amplify as I added more contact paper to build the letter. Eventually, I would be so far off that the bottom of the letter wouldn’t meet up with the top. At times, I had to give up and re-cut everything with card stock. If I had to do the whole thing again, I would have used card stock from the beginning! I’m guessing it took me around 15 hours to lay out all of the letters. (Crazy, right?!?) At that point, my amazing husband stepped in. He used a jigsaw to carefully cut out all of those curvy letters. He then sanded them and stained them. When we did the prototype, we realized that pounding the nails was going to be a big job. Thankfully, our friend, Bryan, stopped by and took half the letters home with him. Bryan and Kent had been playing around with the spacing of the nails and decided they should be one inch apart. They each created their own measuring system to map out how they would place the nails one inch apart along the entire perimeter of each letter. Bryan enlisted his four sons to help him pound nails. Kent ended up doing the last four letters on his own. 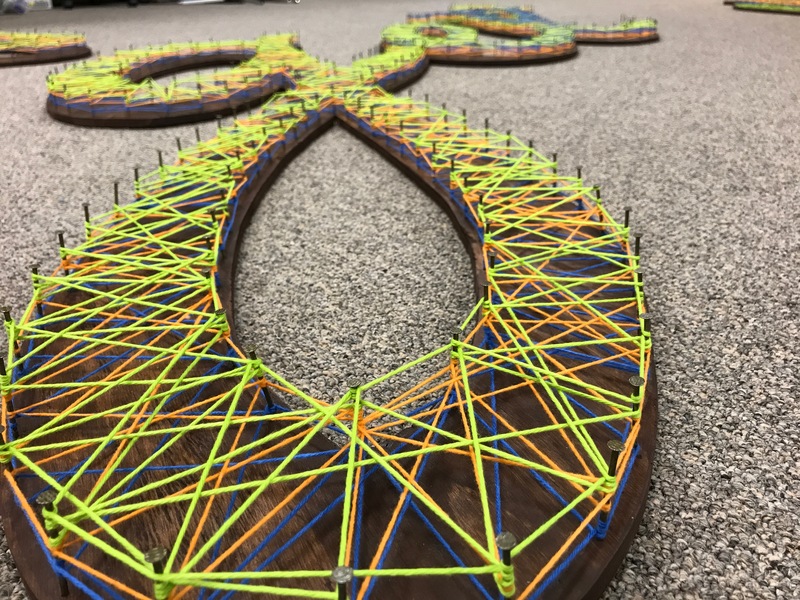 Finally, it was time for the fun part of this project — the string art! 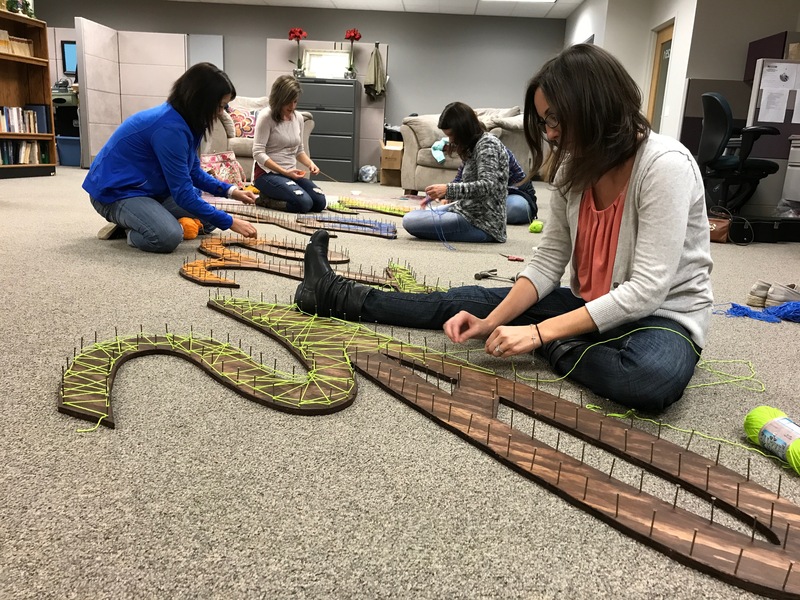 I had asked a bunch of crafty, creative women to help me do the string art. Only a few of the ladies had ever done string art before. We had so much fun doing the string art. With seven of us working together, we were done in about two hours. 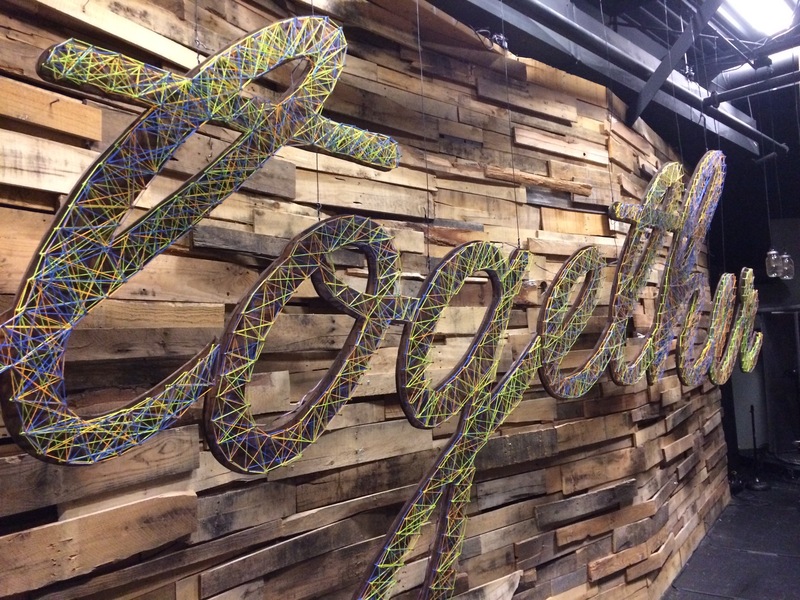 We wanted to layer the three colors from the Together logo to wrap and intertwine. We felt this was a creative way to visually communicate the key verse for our series, Ecc. 4:12. The final step in this process was the installation of the word on the wall. Bryan and Kent constructed a system to hang the letters with wire from a pole they installed in the ceiling. The letters look like they are floating in front of the pallet wall. The letters are so large that they were cut from six pieces of plywood. They used brackets to attach the letters in back. Bryan then had the genius idea to add strips of LED lighting to the back of the letters. The lights can change color so when the auditorium is dark, the word takes on a completely different look and feel. I’m so thankful for the amazing team of people who helped make this project happen! It was so fun to create it TOGETHER! This is amazing! And the team of people working “together” to make it happen gives it even more meaning and value. Love this and love hearing how the church is growing! Thanks, Kelly! It’s been really fun to see God working at The Sanctuary! Thanks, Lara! It was definitely a stretch for the Silhouette, but it worked really well! I definitely had to replace my blade once that project was complete, though! SUPER WOW!!!!! A ton of creative work, & so very well done!!!!! Hey! We are looking at something similar for our church. 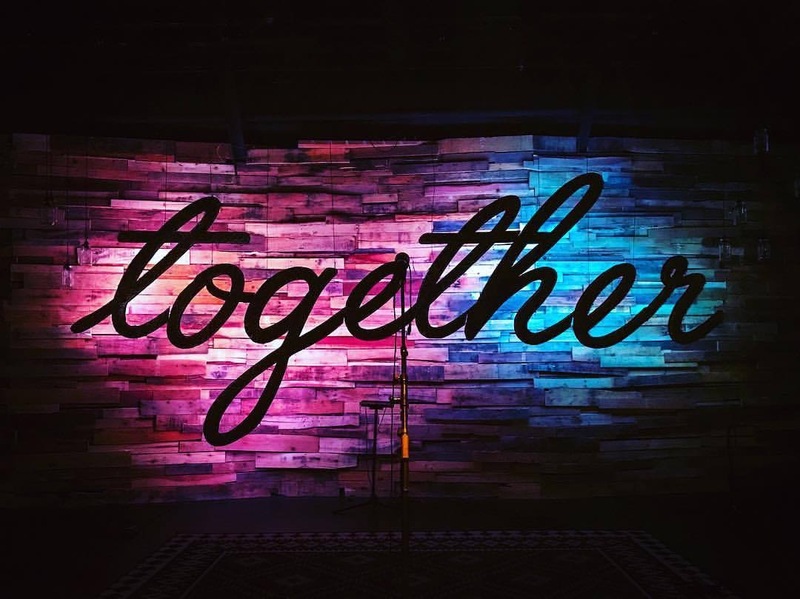 Do you remember what font you used for the word “together”? Thanks! Hi Dave, the font we used is called Angelface! I would love to see what you guys come up with! Let me know if you have other questions.